This is Issue #20! Wow! Thanks to everyone who has submitted, subscribed, or read the newsletter in the last few months. There are more great events coming up this month - make sure you read all the way to the end! If you are looking forward to Live Art Magazine as much as I am, check out the preview podcast at NEPR. There will be a couple more episodes as the event approaches! Get your tickets today for LIVE ART MAGAZINE ISSUE #3! From the article: It's easy to put artists in the box of "whimsical creatures that live outside societal norms," so why would business leaders turn to them for guidance and insight about how to make their organizations more profitable and run more efficiently? 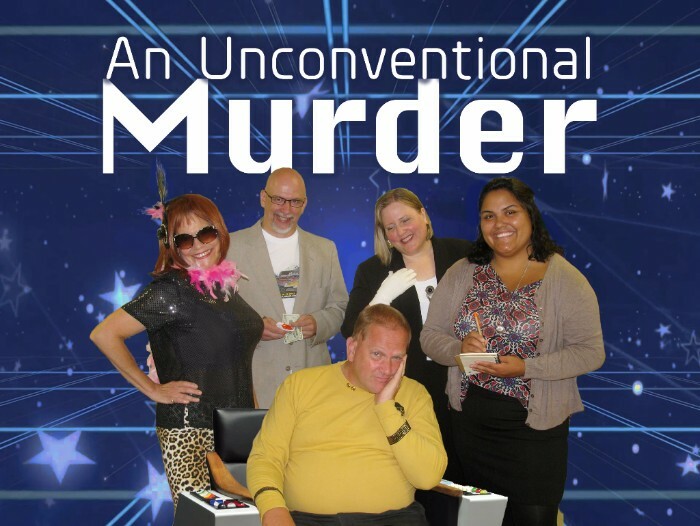 A hilarious interactive show called An Unconventional Murder, with great food for a great cause. Just $25.00 per person including the show and dinner. Call 413 538 8074 or 413 331 3026 for ticket info. 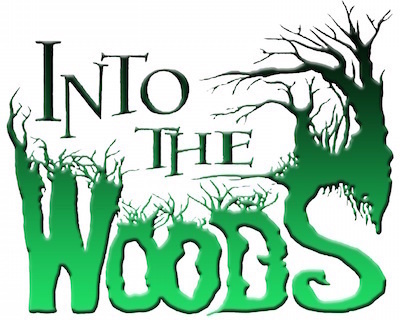 Into the Woods is a modern twist on the beloved Brothers Grimm fairy tales in a musical format that follows the classic tales of Cinderella, Little Red Riding Hood, Jack and the Beanstalk, and Rapunzel - all tied together by an original story involving a baker and his wife, their wish to begin a family and their interaction with the witch who has put a curse on them. What happens when you put one theater actor following the script line by line in a scene with one improviser who has no idea what the script is and has to make everything up as it goes along? You get SCRIPTED/UNSCRIPTED! We've got a fantastic line up of highly respected Valley stage actors paired with the Valley's best and brightest improvisers to create this very popular show that is sure to make your holiday weekend into a HA-HA!-liday weekend! Tickets $10 in advance online and $13 at the door. A SUPER queer time travel adventure. With Dinosaurs. A cross between Jurassic Park, Back to the Future, and Fried Green Tomatoes. 8 short shows in 8 sweet venues, all in walking distance in downtown Greenfield. Everything you ever dreamed of in a weekend of theater, and 20 bucks gets you into everything! Tickets available online. More information on their website. Do we choose love or does love choose us? Dale Johnston, a lonely, middle-aged restaurant manager in a small Alabama town has his world turned on its head when his dream girl comes to work for him. 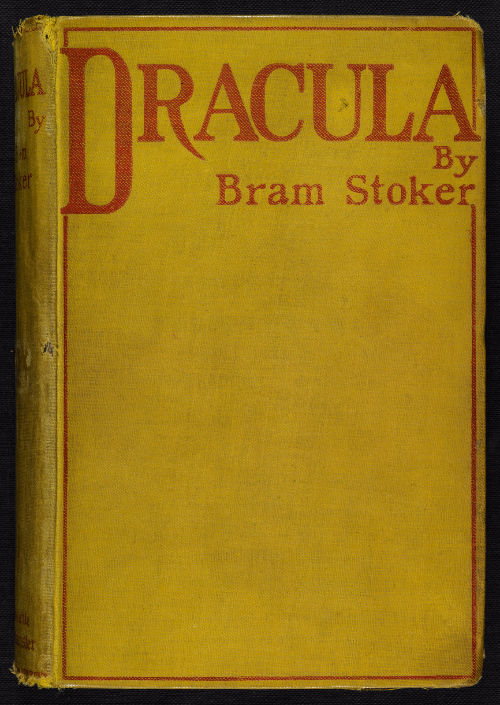 But for Dale, perhaps dream and nightmare are one in the same. Is society placing unnecessary obstacles in Dale's way, or does he simply have a skewed view of reality? 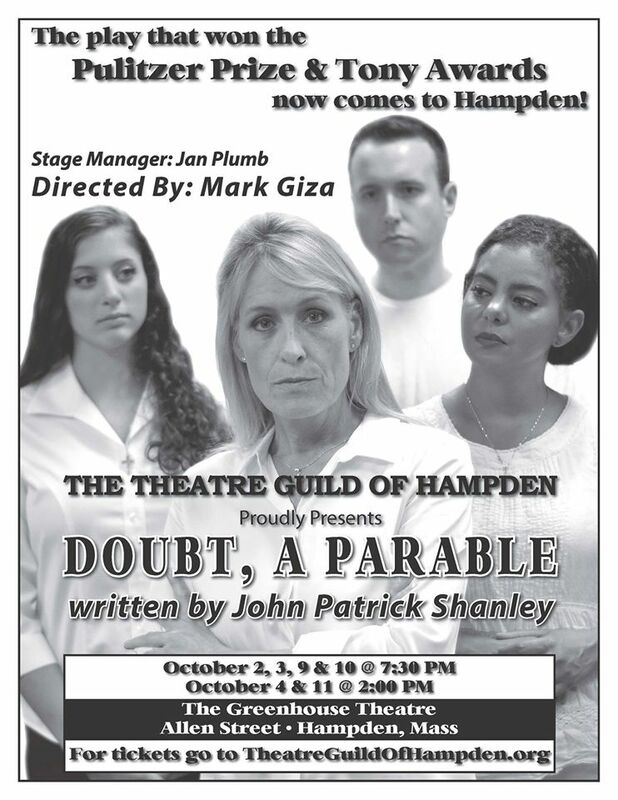 Playing four performances on October 16th and 17th at 6:00pm and 8:00pm both evenings. Festival tickets can be purchased online. Facebook event here. 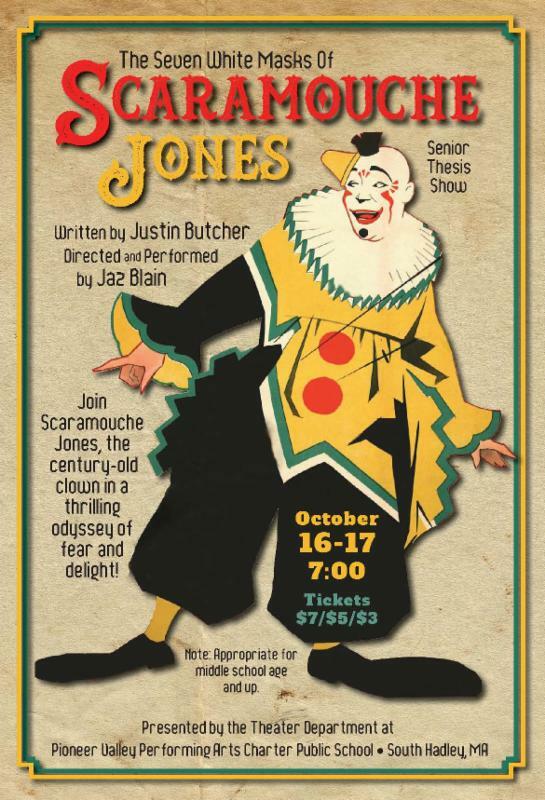 A one person show written by Justin Butcher and performed by Jaz Blain that tells the life story of a 100 year old clown Scaramouche providing a frightening and delightful perspective on the world in the 20th century. Tickets are priced at $7/$5/$3. Unapologetic is a collection of women-centric pieces. This series of works will present several different narratives performed in the same space. What does feminist theatre mean to the individuals who experience it? What conversations are created post performance when one person considers a piece to be feminist and another does not? How can one space support three different narratives without claiming a universal experience? Featuring: Marisol by Jose Rivera, Haiku by Katherine Snodgrass, and selections from 365 Days/365 Plays by Suzan Lori Parks. Evil Dead: The Musical unearths the old familiar story, [where] boy and friends take a weekend getaway at abandoned cabin, boy expects to get lucky, boy unleashes ancient evil spirit, friends turn into Candarian Demons, boy fights until dawn to survive. Based on the cult classic Evil Dead movie trilogy created by Sam Raimi and Bruce Campbell. 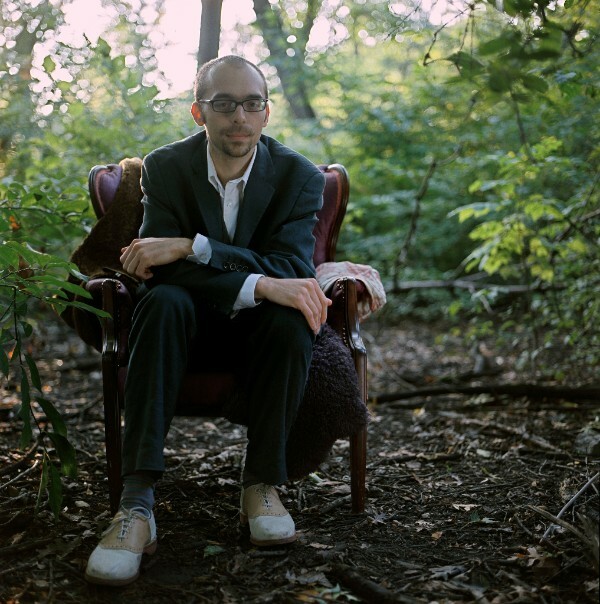 Kevin Tracy directs the work, which features a book and lyrics by George Reinblatt, music by Frank Cipolla, Christopher Bond, Melissa Morris and Reinblatt. Music direction by Eric Johnson and conducted by Ted Trobaugh. Produced by Megan Healey. Choreography by Sarah Devine. Fight choreography by Emily Eaton. The cast includes Joe Van Allen (as Ash), Erin Fitzgerald (Linda), Samantha Hinds (Cheryl), Christine Voytko (Annie), Emily Eaton (Shelly) Monique Dubois (Fake Shemp/Moose), Christopher Rose (Ed), Colin Allen (Scott), Russell Nadeau (Fake Shemp) and Josh Mason (Jake). 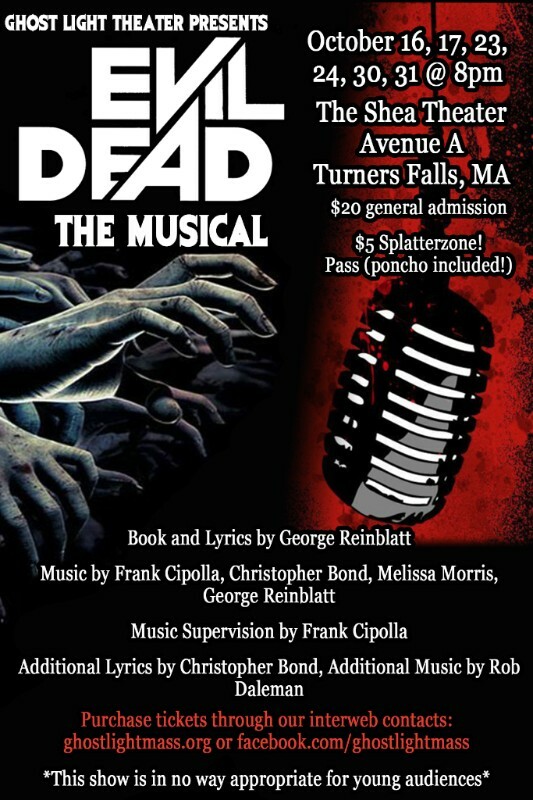 Tickets are available through Eventbrite for $20 ($5 more for splatter zone pass with poncho). For more information, visit the website or Facebook. Live Art is a fast-paced, staged “magazine” of contemporary art, music and commentary, a live show structured like a magazine: first ‘the front-matter,’ a series of fast-paced, 2 to 4 minute surprises, followed by ‘the well,’ the main body of two or three 6 to 8 minute works that dig a bit deeper. Live Art is part of the national pop-up magazine movement. 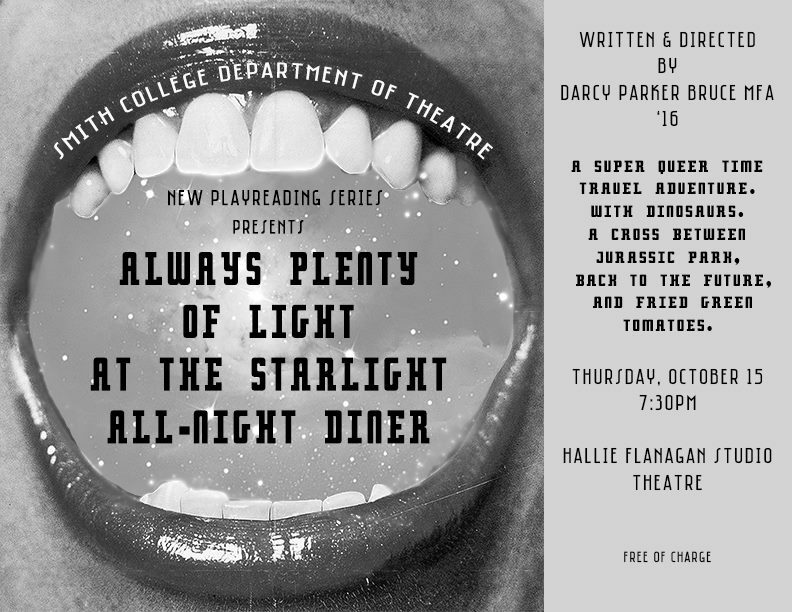 Our event offers ephemeral and memorable writing and stagecraft for one-night-only. Recording, filming and photography are forbidden. This protects works-in-progress from documentation so that artists are free to push the boundaries of their art. It is a 21st century anomaly, an intimate presentation in a time of mass communication. It’s non-digital new-media! And it’s magical fun. Our live magazine showcases our some of our best local and regional writers, poets, artists, musicians, dancers, filmmakers--creative “risk-takers. We’ll feature award-winning NEPR radio producer Karen Brown’s new live radio piece, and work by Karen Skolfield, NEPR’s Arts & Humanities award winner for 2015. Skolfield will trade witty, gorgeous poems on stage with Floyd Cheung, poet and Smith prof. NEPR is developing a “Live Art Magazine” podcast highlighting our feature performers and their artistic process--but NOT the work you’ll see on Friday, October 23rd! You will be able to download three episodes of the podcast in the weeks before the performance. Check out the complete line up online. Purchase TICKETS through the Academy of Music. $10 for students, $14 for General Admission, and $18 at the door. "Funny one moment, achingly sorrowful the next, METAMORPHOSES somehow manages both to lift you out of the moment you're living in and speak to it with piercing directness." -The Wall Street Journal. Set in and around a large pool of water, METAMORPHOSES is a refreshingly contemporary poetic chronicle of Greek mythology. 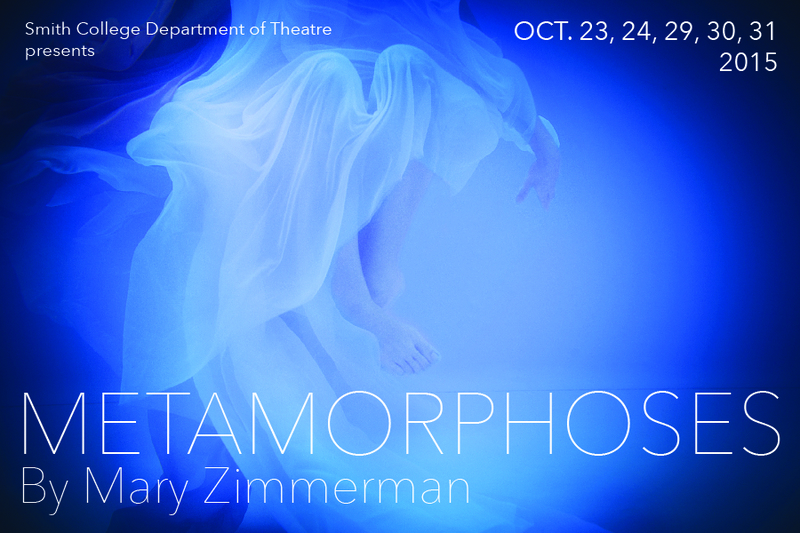 Based on David R. Slavitt's translation of The Metamorphoses of Ovid, METAMORPHOSES brings familiar tales of love and loss to life. Tickets and more information available online. Facebook event here. 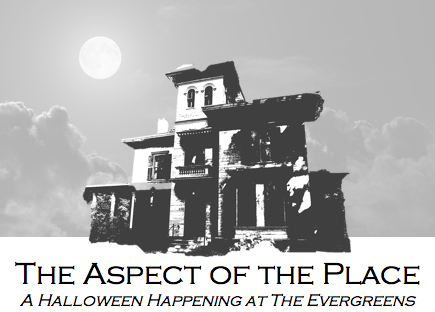 TheatreTruck gets into the spirit of Halloween with this story-telling celebration of ghosts and the Gothic at The Evergreens. TheatreTruck and TEDM partnered this Summer to produce a sold-out run of The Emily Dickinson Project, attracting audience from all over the Pioneer Valley, the nation and even the UK! TheatreTruck​ is dedicated to crafting mobile and site-specific performance, sustainably & playfully and is delighted to be partnering with the Museum once again. The Emily Dickinson Project Director and Co-creator Brianna Sloane curates the Halloween event. The online application form is now open and available here. The application process will be online only. Please do not submit paper applications. These grants can support a variety of artistic projects and activities in Northampton, Florence, and Leeds, including exhibits, writings, festivals, field trips, short-term artist residencies or performances in schools, workshops and lectures. Performances: January 30th at 7:30pm, January 31st at 11:30 and 3:00pm (dates may be subject to change). To schedule an interview with the director, please email a resume or Letter of Interest to Tony Jones. Be part of this fun and exciting high quality musical theater performance workshop that culminates in a full scale Musical Theater Revue. April 8-10. Looking for talented children/teens, aged 4-12 grades. Directed by Becca Greene-Van Horn and music directed by Benjiman Durfee and Cindy Naughton. If cast, the fee for the workshop is $269. Scholarships are available. Sign up for your audition slot by calling LSSE at 413-259-3065. Find information on the audition online. In its fourth year, YOB has provided opportunities for many local area youth to sing leading and featured roles from many different shows. Doing many broadway hits, gives more youth a chance to shine than happens with just one play. Don't miss this wonderful opportunity. *Prepare a 1 minute comedic monologue (a story, joke, or speech). *Slots are in 5 minute increments and are first come first serve. *Arrive before your audition time to fill out paperwork. The JCC will walk any children who are signed up for Hebrew School on Tuesdays at 5:30 to Sinai. Please let us know if you need this service. Fee is $140 for JCC members/$175 for general public. This fee includes a professional performance DVD, two tickets to Preview night, scripts, and a J-Art Youth Theater Shirt. CALL FOR THEATER PRODUCTION STAFF! Black Cat Theater, a community theater group based in South Hadley, MA, is seeking letters of interest and resumes for the positions of Artistic Director, Music Director, Producer, Stage Manager, and Choreographer their Spring 2016 musical, “Disco Inferno”! This show will have a primarily youth cast. Interviews will be held on October 28. Auditions for the show will take place on November 16 and 19. Rehearsals will begin January 21 and will be held on Mondays and Thursdays. Show dates are April 14 through 17. Email a letter of interest and resume by Thursday, October 15. The Department of Theater in the College of Humanities and Fine Arts invites applications for a tenure-track position in Scene Design at the rank of Assistant Professor, to begin September 1, 2016. This professor, specializing in scene design, will be an impressive professional practitioner and teacher who will bring experience and vision to the Department. The successful candidate will teach MFA graduate and undergraduate courses in such areas as Scenic Design, Drawing/Rendering, Architectural History, Scenic Painting, Scale Model Building, Drafting, Computer Skills, and collaborative classes across theater disciplines. The professor is also responsible for the scene design, scenic art and properties design of the department's main stage season, the supervision of student designers and artisans, as well as contributing other specialties to complement departmental offerings. The professor will collaborate closely with all production areas including the Scene Shop Faculty and Staff, consisting of the Faculty Technical Director, Scenic Construction Director, 2 graduate students, and numerous undergraduate work-study and practicum students. Two newly renovated theaters include a 450-seat proscenium and a 100-seat flexible performance space. Participation in departmental and university service is also a responsibility. To apply submit a letter of application, a curriculum vitae (or detailed professional resume), a link to your online portfolio, and the names and e-mail addresses of three references here. Applicants should apply by the priority deadline of November 2, 2015, in order to ensure consideration. Pre-requisite: Just a willingness to disempower failure. EVERYONE can do this workshop. Weathering mistakes and overcoming setbacks are tricky but absolutely vital both at work and at home. In this workshop, improv exercises provide many experiences that help you understand that defining something as a "failure" only sets up roadblocks; and instead you can see it as a judgment-free event, freeing you to move forward with more confidence and creativity. And you learn it all through laughter! Empower yourself by disempowering failure with this powerful workshop. Pam Victor is a teacher, improviser, and author in Western Massachusetts. She designed and teaches the Zen of Improv a multi-level improv curriculum as well as the entire Through Laughter Program. Pam writes the “Zen of Improv” series, a sassy (and sometimes saucy) look at the alignment of improvisation and Zen thinking as well as the well-respected "Geeking Out with..." interview blog series. Along with legendary improvisers TJ Jagodowski and David Pasquesi, Pam is the co-author of Improvisation at the Speed of Life: The TJ & Dave Book. Pam is the founding member of The Ha-Ha’s with whom she performs at The Happier Valley Comedy Show (Arts Block Cafe/Greenfield), which she also produces. She's a regular performer with the Majesters (Majestic Theatre/W. 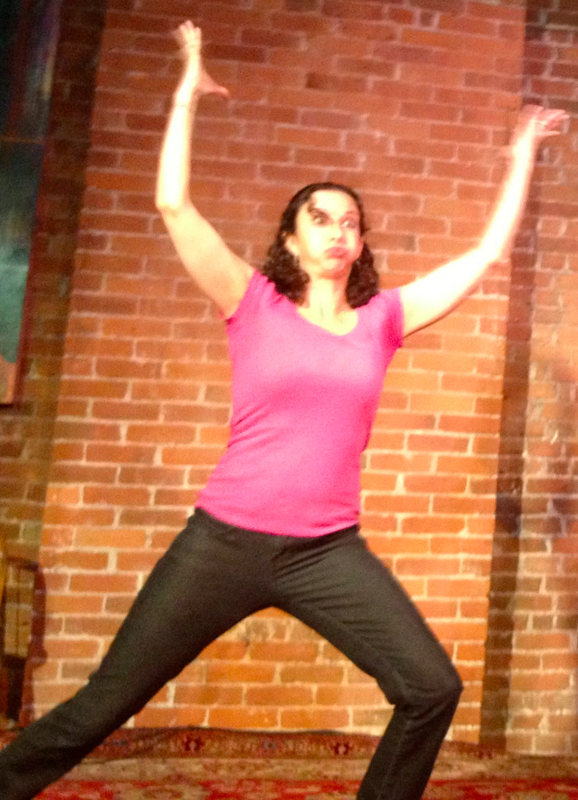 Springfield), and when she's lucky she graces the stage with her dear friends at ImprovBoston. A graduate of Smith College with a Master's in Education from Iona College, Pam has received improv training from iO Theater (Chicago), Annoyance Theatre (Chicago), ImprovBoston, and from Second City teachers. Join AES for the Springfield Artist-in-Business (AIB) training on Friday, October 16 - Saturday, October 17, 9 am - 4:30 pm at the UMass Center at Springfield. In this two-day intensive, artists learn best business practices and create elements of their marketing/business plans, leaving with next steps to build – or expand - their unique business. For more information visit our website. To register directly for the training, click here. The registration fee for the Springfield AIB training is only $25 for Springfield and Indian Orchard based artists. The registration fee for all other artists is $40. Note: use the drop down menu on the registration page to select the proper fee. This training is a project of the UMass Amherst Arts Extension Service's Arts Entrepreneurship Initiative with partners Art for the Soul Gallery and the Springfield Museums. 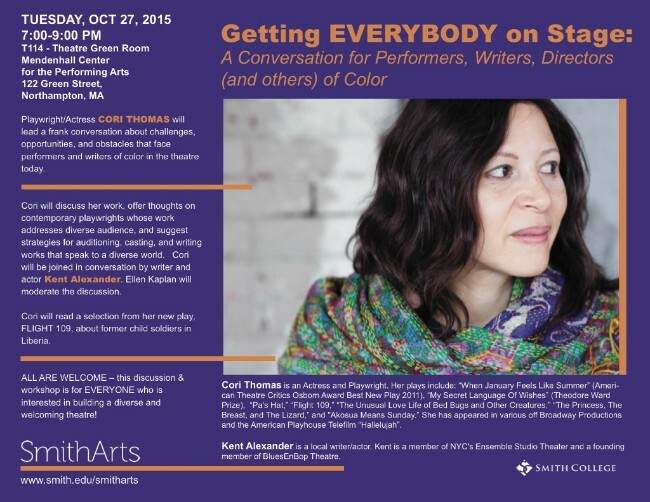 Playwright/Actress Cori Thomas will lead a frank conversation about challenges, opportunities, and obstacles that face performers and writers of color in the theatre today. Cori will discuss her work, offer thoughts on contemporary okaywrights whose work addresses diverse audience, and suggest strategies for auditioning, casting, and writing works that speak to a diverse world. Cori will be joined in conversation by writer and actor Kent Alexander. Ellen Kaplan will moderate the discussion. Cori will read a selection from her new play, FLIGHT 109, about former child soldiers in Liberia. ALL ARE WELCOME - this discussion and workshop is for EVERYONE who is interested in building a diverse and welcoming theare!